Starting Friday, New York City police officers must inform civilians of their right to refuse a search if an officer has no warrant or lacks reasonable suspicion of a crime. Officers will also be required to hand a business card to civilians who they stop to question, frisk, or search. The new rules are known as the Right to Know Act, a law that drew the ire of the city's powerful police union and took four years to pass the City Council. It is intended to decrease illegal searches, give civilians more power in police interactions and ultimately build trust with communities that have grown wary of police. City councilman Antonio Reynoso, who represents parts of Brooklyn and Queens, sponsored a portion of the new law. He said for years, civilians were unaware of their right to refuse a search during certain interactions with police. Reynoso wants the language to become ordinary and routine, like reading someone their Miranda rights. But police reform advocates said the language is too weak and doesn’t make the right to refusal clear. And there's another issue. Michael Sisitzky from the New York Civil Liberties Union said the law is supposed to include getting consent to search someone's home or vehicle too, not just their person. “That’s not what we’ve seen the NYPD develop so far in their guidance. All the guidance that we’ve seen so far just relates to street encounters,” he said. A spokeswoman at the NYPD said home and vehicle searches may not be explicit in the patrol guidelines, but it should be self evident to officers. She said the NYPD would be monitoring the situation and if systemic issues arise, the department could make changes. The union that represents police officers fiercely opposed the law. In a written statement, PBA President Patrick Lynch said, "The Right to Know laws will discourage police officers from proactively addressing crime and disorder and will lead to more frivolous complaints." Complaints are expected to rise because officers will also be required to hand people a business card with their name and shield number on one side and information on where to file a comment or complaint on the other side. Ultimately complaints will be routed to the Civilian Complaint Review Board. “We've been working closely with the NYPD to make sure we know how they're training their officers so we can hold members of the service to the standard to which they've been trained,” said Jonathan Darche head of the CCRB. Police reform groups said they would be training communities on how to assert their rights. Even though police reform advocates criticized certain lawmakers for compromising too heavily on particular parts of the law, it is still seen as a major victory. Yet many remain skeptical police will comply. Yul San Leim, from the grassroots police reform organization Justice Committee, said groups like hers would be monitoring the NYPD. “We are putting eyes on the street. 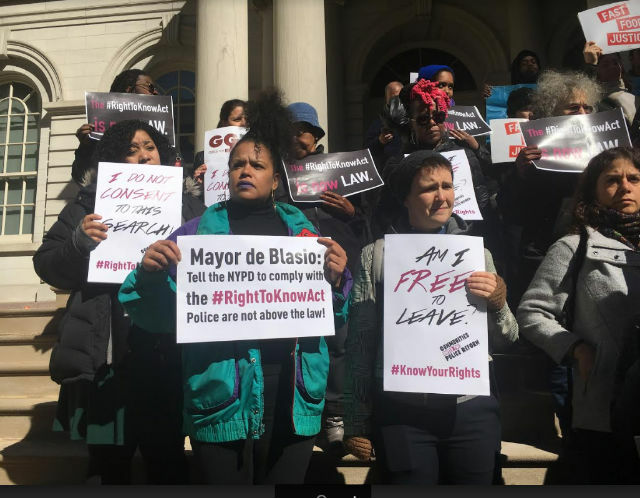 And we're here to say to the mayor and the commissioner, tell your officers to fully implement the Right to Know Act and tell them the streets are watching,” Leim said.